Usually, when I am focused on healthier eating, white pasta, white flours and white rices come out first. Hence.. the bitchiness! Who attempts to eat vegan on top of eliminating refined junk food while simultaneously knowing nothing about juicing or even eating vegetables for that matter. Seriously, how is one door suppose to open until the other is closed. How does one go from junk to health. Oh, for the record, this was an attempt at going vegan for health and diet; not necessarily at this point knowing anything about the animals. There is a difference and in the long run, it does matter. So I’m trying to order something exciting in a seafood place. All they had to offer me was lettuce and tomato. Just a heads up.. this is when I get really nasty. lol. Where did all that anger come from anyway? I’m guessing people experience moods or feelings of deprivation and lash out. It’s not like I was starving by any means. I was a brat and an indulgent one at that. Why go to a seafood place if you are vegan anyway? I can just hear the waiter thinking it. I bet the same tho ughts go through most minds as if, especially in todays age, there isn’t already enough to worry about with concern for allergies. Oh these vegans, why do they eat here? First of all, there were no vegan restaurants 15 – 20 years ago. Ok.. I exaggerate. I think Souen and Angelica’s Kitchen were around (NYC), both of which weren’t exclusively vegan back then. I could be wrong. Second, if I’m going out socially, my friends are all non-vegan and don’t want to go. Again, I’m talking years ago. Now it’s different. There are options and I have new friends. Hahaha j/k. My friends do love me and will definitely eat vegan to hang out and catch up. If I have no choice though, I will go out non-vegan so here is my survival guide. Keep in mind that I’m vegan and healthatarian – no white crap refined junk. Any place that can create something better than a dish of lettuce, tomato and cucumber is going to be ok. With that in mind, it will be alright and if not, just have a drink and or a cup of tea and be hospitable! Japanese is fantastic. I will tell you this though; I have walked out of many a Japanese restaurant for not having brown rice. Don’t get me excited about a maki roll only to tell me you can’t make the rice stick. We all know you add stuff to that sticky rice anyway lol and probably sugar too! Hey.. that’s the hazard of dining out; and this is the good option. They also sneak sugar into the hijiki seaweed salad. At least they have seaweed, and pickled foods, all kinds of tofu, papaya or avocado salads, veggie rolls, miso soup and more. I usually ask if the miso soup has fish. For the record, you can’t say is it vegetarian. Sometimes, people think fish is vegetarian. I get sweet potato rolls if I’m lucky or some cool roll with mango and avocado. The default here is always cucumber avocado. Korean restaurants will also usually have a nice tofu dish. They do those sizzling hot bibimbop bowls. Delicious! Chinese is a good choice but please, if you go out to dinner with me- REMIND ME- sauce on the side! Otherwise that dish of brown rice and veggies is now swimming in a heart attack of high sodium. Mexican is a favorite of mine. I hate to compromise my values but GMO VS. VEGAN, vegan will win. At least until they genetically modify a burger from some chemical concoction. I think the closest is called in-vitro aka lab meat. Then I will be for it (to cut down the mass production of factory farming); although I won’t eat it. That is a whole nother blog. So when dining Mexican, I refuse the flour tortilla and go with the GMO corn. Oops.. did I say GMO VS. VEGAN; I meant GMO VS. HEALTHATARIAN. I will not eat white flour. Corn tortilla it will be. I do wish for organic ones but that’s not going to happen mainstream while the entire corn industry is subsidized. Guacamole is a lock but easy on the deep fried chips. 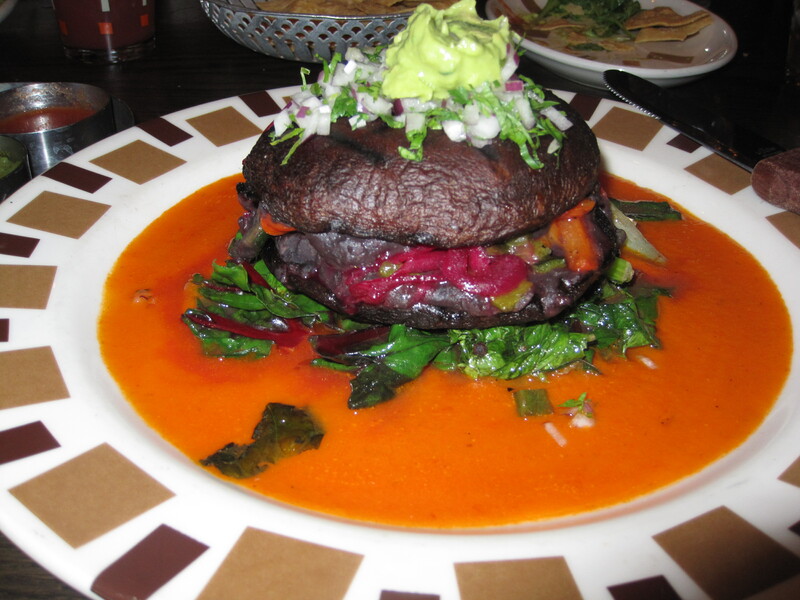 Beans and mushrooms are usually an option at Mexican restaurants. Make sure the beans have no animal ingredients. If you are eating at a food truck, be careful; a guy once told me the beans were vegetarian with a little bit of pork fat. You see what I’m saying! Interestingly, I will never buy anything with GMO corn or soy, but if I’m stuck dining out somewhere with not great options, I do cave in. It’s almost always a corn tortilla or a piece of soy chicken. I’m trying! Vegan restaurants are super guilty of this too. Indian yes, of course!. They will always have a vegetarian menu. Remember: milk, cheese and eggs are NOT VEGAN! Lentils and peas are my best friends. Middle Eastern is another good one. Falafel is vegan. Say no more! Well, just one more thing; I love my hummus and vegan sides with whole wheat pita. Moving along, NO my Italian brothers and sisters – you are far from making the cut. Why? Perhaps because the only green vegetable you know is broccoli rabe. Annoying. Your spinach is super sautéed with butter and sometimes grated cheese. I can ask for olive oil and then secretly, the next thing I want to know is if it’s a blend. Don’t you dare sneak those GMO oils in my food. All of sudden, I forget I am a vegan and the anti-Monsanto anger comes out. Perhaps I am angry. But today it’s for a reason and it’s targeted! It’s to the factory farming production and it’s supporters and to big bio-tech firms destroying our food, water, air and earth under the good name of saving the world. Honestly, who wouldn’t be mad. Or perhaps too, it’s just because I suspended pasta from my diet. That probably adds to it lol. Once, in an Italian restaurant, the professional waiter said the polenta was vegan no meat. There were no physical signs of meat, as he puts it, and he swears no dairy but personally, it was probably chicken stock, milk, cheese and GMO corn. Sarcasm aside, you could have pasta just fine if you want. Ask questions, learn and move on. For me, Italian is out. Steak house in. Crazy as it sounds and only if I am forced, I will go and get better vegetables there then most restaurants. One can survive quite nicely on sides. Scared to out yourself as vegan?Just tell them you are allergic to milk and cheese. Don’t assume they know how to define the word vegan. For the record, only my Mom on Mother’s Day or a best friend’s wedding will get me at a steakhouse, otherwise, hell no! (2) Live on the sideline. It won’t kill you to amp up your vegetables. Order just sides. Try it. You will be surprised how many things all of a sudden have milk and cheese in it. Otherwise, they are fried, which is a healthatarian no no. It’s getting better in this department. If it’s a good restaurant, they will make your sides look pretty and everyone will be staring at your dish. (3) Build your own salad. If in doubt, go green. This used to scare me because of the experience 15 years ago but it’s better now, although I’m not sure by how much. They have to have something, right? Scan the salads and the menu. Choose what you want and tell them. I will generally ask for a combination of salads and then kindly tell them I am a good tipper. I want spinach or kale to be exact. I want something other than tomato and cucumber – say maybe endive, sun dried tomato, carrots, peppers, avocado. Then go for the kill- ask for your protein. Do you have walnuts, almond slices, pine nuts, pumpkin seeds or chick peas? Top that beautiful salad off with some sliced apple or pear and dried cranberries or pomegranate seeds. Now we are talking. They have a grain? – well then, fabulous! For the record, if a restaurant has an avocado, my day is complete. Best salad to date was in the tiny town of Pine Hill, upstate New York, in the middle of nowhere. The picture is right here: mixed greens, quinoa, chick peas, tomato, cucumber, squash and guacamole without me even asking a thing! (4) Power grains and legumes. Don’t listen to paleo heads. Do you really want to take advice from someone that compares themselves to a caveman. I won’t get started here because that blog is already in the works. All grains are not created equal. Yeah, avoid processed ones. Reduce your addiction to bread if you have one. If you are lucky, they will have a dish that is a good grain and vegetable combo. You don’t have to have high protein all day long nor do you have to have a protein and a big carbohydrate together in every meal. Your digestion system would actually prefer that you don’t. You can combine either though with greens and vegetables. With these and other choices, your body can still gather all the amino acids necessary to build complete proteins. Speaking of mushrooms, that’s a meal and a half. If you see large portabella mushroom caps –jackpot! It’s a vegan steak. Take it and run. If you are super lucky, you will see a nice tofu dish.. seared or grilled; something fancy! I’m not just talking Asian cuisine; some places will go all out. Now if you are really in the right place at the right time look out. I have had quinoa risotto with plantains in a Spanish restaurant done really well. I have had seitan cutlets in a few places. The best yet though, was the cauliflower steak. It was three vegans, three non vegans and six cauliflower steaks. Those copy cats! It could happen. (5) You could always call ahead! They are much more accommodating on the phone prior to a reservation being made. Hosts and managers sometimes have more insight, professionalism and patience than a rushed waiter. They can tell you right away what is vegan and what is not. You can check the online menu too. To be competitive now, restaurants really have to offer something for everyone- vegetarian, gluten-free, paleo, nut-free, kosher, vegan and so on. Being vegan today isn’t as hard as years ago. If you are a newbie, remember to come out of the vegan closet! Represent.. ask questions, make suggestions, be vocal about what you want; spread the love and awareness and heighten the desire for vegan food. With increased demand, comes supply. Support the vegan restaurants and places that go out of their way to veganize. A great example that I have seen lately, is the Yard House with a special GARDEIN section. Some restaurants will have a separate vegan menu altogether. Even Chipotle introduced a vegan item: Sofritas. It has to be something cool – not just an improvised salad or side. Give us some substance that isn’t pasta, GMO corn or cheap nutritionally deficient white bread or white rice. They need to get creative and step up their game. Never know when Beyoncé might pop in.